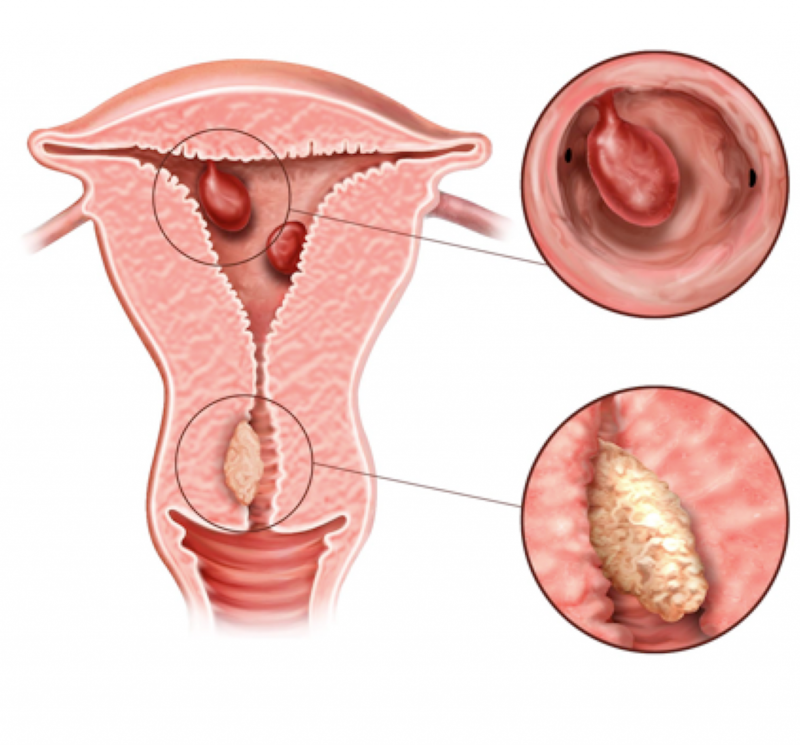 Endometrial polyps are a common cause of abnormal bleeding from the female genital tract and may occur in both premenopausal and postmenopausal women. Endometrial polyps are a common cause of abnormal bleeding from the female genital tract and may occur in both premenopausal and postmenopausal women. They are ‘overgrowths’ of the tissues lining the uterus (endometrium) and project inwards into the cavity of the uterus. Some polyps may arise from the neck of the womb (cervical or endocervical polyps). Uterine polyps usually measure less than 2cm in diameter although some may be significantly larger. Polyps may also be present without causing any symptoms or affecting your health in any way. The vast majority of endometrial and cervical polyps are benign, but malignancy occurs in some women. The exact cause of polyps are not known although several molecular/genetic mechanisms have been proposed to play a role in their development. Endometrial polyps are responsible for approximately one-fourth of cases of abnormal genital bleeding in both premenopausal and postmenopausal women. Note: Many polyps are asymptomatic. unscheduled (‘breakthrough’) bleeding on hormonal therapy e.g. oral contraceptive pill. It is controversial whether endometrial polyps contribute to infertility or poor pregnancy outcomes such as miscarriage. A randomised trial suggested that removal of polyps increased pregnancy rates in women undergoing intrauterine insemination for pregnancy. Given these data and additional evidence that distortion of the uterine cavity by fibroids (see section on uterine fibroids) decreases successful pregnancies, most practitioners routinely remove polyps prior to an IVF cycle. Endometrial polyps are definitively diagnosed by microscopic examination of a specimen obtained after removal. Excision permits both diagnosis and cure of these lesions. Neither ultrasound imaging nor hysteroscopy (telescope in the womb) can reliably distinguish between benign and malignant polyps. Polyps protruding through the neck of the womb may be visualised during a clinical pelvic examination. Sonohysterography — Sonohysterography is an ultrasound procedure aided by prior instillation of fluid into the uterine cavity. This is the most useful ‘non-invasive’ modality for evaluating polyps in women with abnormal uterine bleeding. However, fluid instillation is not routinely performed in clinical practise in the United Kingdom with ‘real-time’ transvaginal ultrasound (see below) remaining the initial investigation of choice. 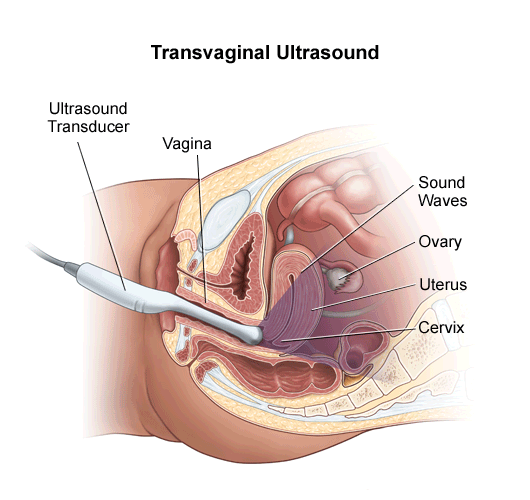 Transvaginal Ultrasound — The term “ultrasound” refers to sound waves of a frequency greater than that which the human ear can appreciate. Real-time ultrasound imaging is the most common sonographic technique used in gynaecology, including for the detection of endometrial polyps. Hysteroscopy — Endometrial polyps are often detected by means of hysteroscopy. This involves the insertion of a thin telescope into the uterine cavity so your gynaecologist can look more closely at the inner lining. 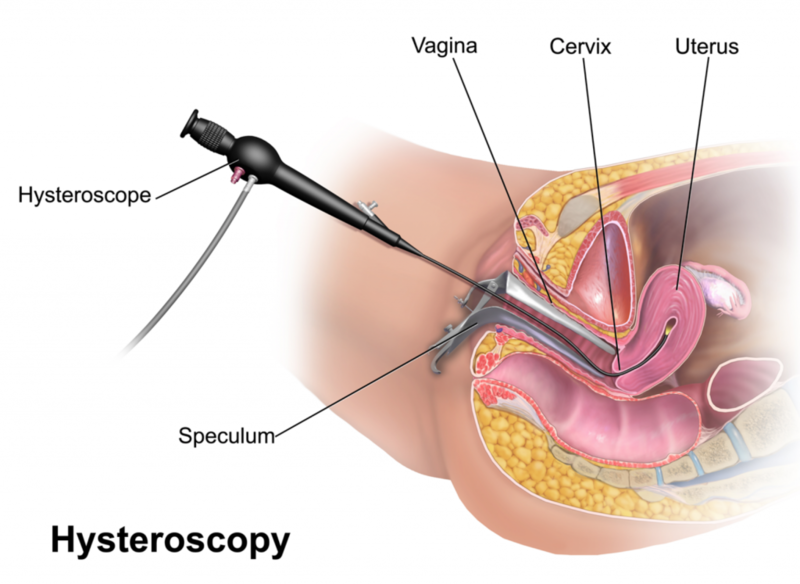 Once a hysteroscopic examination has taken place, polyps can usually be removed at the same time. Any tissue removed will then be sent off for laboratory (histological) examination. This is simply to confirm the diagnosis and rule out other possible abnormalities. Studies have shown that polypectomy (removal of polyps) results in improvement of symptoms in 75 to 100 percent of patients. The most effective method for removing endometrial polyps is through hysteroscopy (see section on treatments). Polyps that are visible in the region of the neck of the womb may in many cases be removed at the time of clinical examination. Endometrial and/or cervical polyps, once removed, may recur. It is possible that you might need to undergo further treatments in the future although this is not usually the case. If your polyp is not causing you any bothersome symptoms, you may choose to do nothing or monitor with a repeat ultrasound scan in a few months’ time. Your gynaecologist will help you make the decision which is right for you.